The LG G5 has some cool stuff going on with it. It has those swappable battery packs that lend the phone new powers, a powerful processor, QC 3.0 with a USB Type C plug, dual rear cameras, and a host of funky accessories. The one thing it doesn't have is a compelling price tag (it's also dog-ugly IMO). 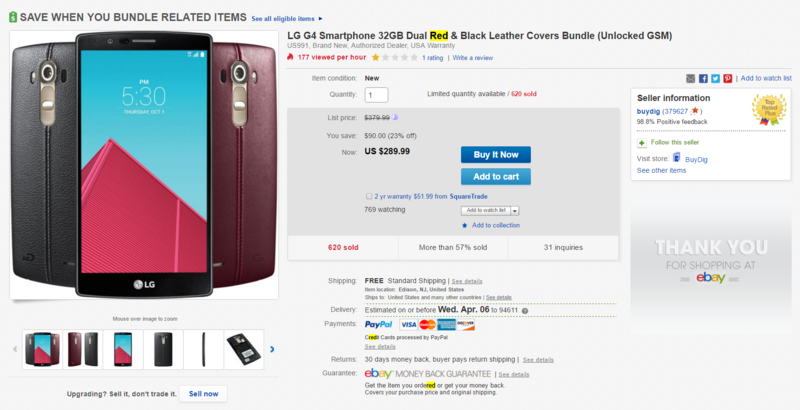 I'll tell you what does have a great price though, the unlocked LG G4 that's on sale right now on eBay for a paltry $289.99. That's less than half the price of the G5 for those of you keeping score. If value is the most important factor in your phone-buying decision, then it's hard to find many more enticing options than the G4. It was already a good deal a couple months ago, and now it's $60 cheaper. Not too shabby. The model on sale is the same as last time, the US991, which supports almost all of AT&T and T-Mobile's bands. The only thing to be aware of for T-Mobile customers is that HSPA+ will only be available in areas that have been re-farmed to 1900MHz. Sprint's bands are also supported, but as Ryan stated in the previous deal alert, Sprint is weird with unlocked devices, so proceed with caution. In addition to a lower price than last time, the seller is also throwing in a second red leather replacement back for free to accompany the standard black one. That's great news for those of you who won't leave the house without color coordinating your phone with your belt. The phone ships free and tax is only charged in New Jersey. Want one? Then follow the link below.